What is a meter ? Definition and examples. A meter is a unit of length in the metric measurement system. 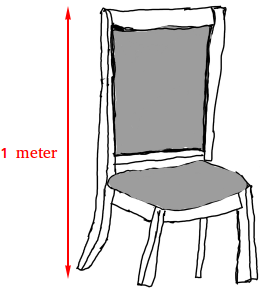 The SI unit symbol is m.
Many side chairs for a dining room set will have a height of about 1 meter. 1 meter is approximately the width of a twin bed or single bed. 1 meter is approximately the height of a recycling bin. 1 meter is approximately the width of many guitars.